Food shopping is one of our greatest indulgences. Whether browsing the wares of the shops and stalls at Atwater Market in Montreal or the produce on display in groceries and markets in Japan, Jean-Francois and I enjoy the hunt for new tastes and flavours. To be honest, we used to horde ingredients. Jean-Francois would chant “In-Greeed-i-ants!” like a possessed madman in a bad horror movie as we shopped. Along the way we amassed large numbers of jars, bottles, plastic bags of spices, sauces, and other flavours that delighted our tastebuds and encouraged our multicultural gluttony. But, unlike hoards of books and magazines and trinkets, our collection required regular purging before the refrigerator burst. And we poor hoarders agonized over the forgotten meals, lost experiences as each jar was held up and we asked “What have we used this for recently?” and then poured the insides down the drain. True, we are better now. We make most of our sauces from scratch, but we occasionally lapse back into bad habits. I took these photos today to show you what I mean. Just the top two shelves of our refrigerator have 37 jars of our most essential ingredients. They include: maple syrup (used weekly), birch syrup (used three times), rice vinegar (daily), ponzu (weekly), cider vinegar (weekly), two types of soy sauce (often), 3 tomato based ketchups (often), 3 mustards, two jars of horseradish (?? 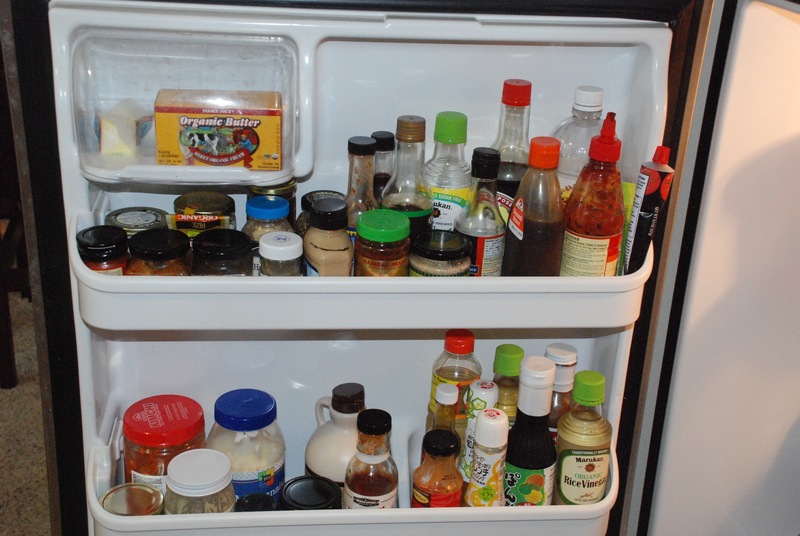 ), two salad dressings that we loved in Japan, soup base for emergencies, and a host of chili sauces and chutneys. The top two shelves, laden with ingredients. A chutney, one horseradish, and a few of the smaller jars have exceeded their best before dates, but the remaining bottles are still youngish. Still this is food waste, and it is a part of the food waste problem that we rarely think about. And considering the distance travelled by these jars to please our pallets–I am ashamed of us. This week, it is time for us to rethink our need for ingredients. Just because we miss eating Okonomiyaki with its special sauce, doesn’t mean we need to run to Little Tokyo and buy a plastic bottle of it (as we did a few weeks ago). I googled. I learnt. We can make some with soy sauce, ketchup and Worcestershire sauce. We can even get fancy with sugar, dashi, and cornstarch. All of which we have in the pantry. Googled to make sure we cannot make it ourselves. Found enough creative food ideas to use the sauce up in less than two months. Asked each other if we really need to feed the nostalgia itch. And, because temptation can be tricky, we will never shop for new ingredients alone. 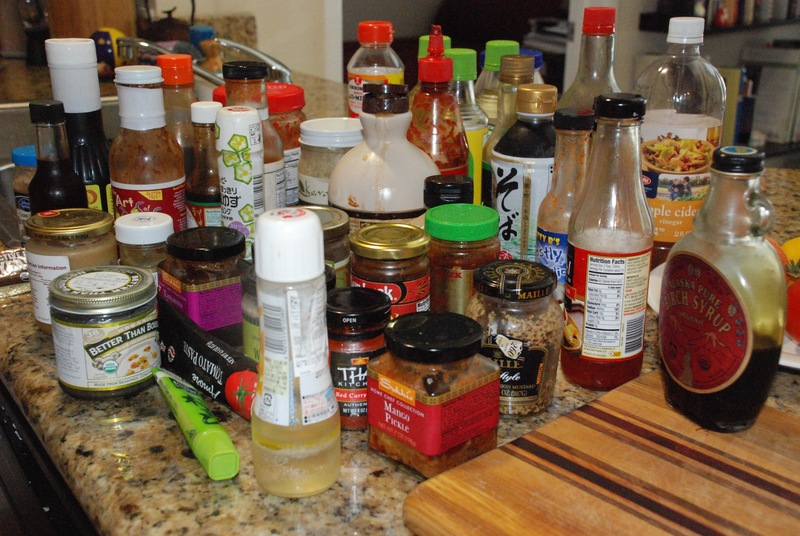 This entry was posted in On food waste, Taking action and tagged bottle waste, chutney, compost, condiments, food shopping, prepared foods, sauces, shopping, wasted food by Bonnie Lee. Bookmark the permalink. I am kellie, and I am a condiment hoarder. There. I have said it. But, like you and J-F, I make a lot of my own condiments (my recipe index is littered with them), in small amounts, reusing jars and dinky little tins. I have made ketchup before, but it is not a patch on bought so I resist my inner recipe developer with that one, but most others I try. Homemade mayo is a real treat and so easy with an immersion blender, and homemade kecap manis ridiculously easy. I do like your mini checklist criteria and may adapt to my own kitchen. Hi Kellie, and welcome to the club. Funny, I just learned how to make kecap manis when looking to make cabbage rolls with seitan. The remainder sits in an old jam jar awaiting its encore. You are right, ridiculously easy. Since drafting this post, Jean-Francois and I have been talking a great deal about flavours we used to drool over, like Patak’s curry sauces. In the early nineties, we had fewer ways to learn how to cook foods from different cultures. More significantly, we had to find markets that catered to international consumers. My guess is that the foodie revolution and the Internet did wonders to change that for a lot of people. So making homemade sauces, curries, and marinades has become much easier. Now, it is just a question of changing habits. Not sure how hard that will be, when some many people buy jarred pasta sauces, but worth the effort. BTW, what does “patch on” mean? That is a new term for me. Our condiment war started with a space problem: a small fridge and weekly FRESH produce which tends to be bulky. Guess what was the first to go? Condiments. It’s boggling how many of them can be made from scratch. With ketchup, I control what kind of sweetner goes into it. Ingredients are long-term stored in the pantry instead, and what a great way to eliminate not only container waste but food waste too. We removed the crisping drawers of our teeny fridge and now store must-have semi-use items there (tahini, yeast, chili garlic paste, miso, wasabi, pickled peppers, veganaise, fruit jams); one of the best things we ever did. High-use kid items fet put to the front there. Because we buy fresh produce from the farm, the rest of fridge is completely EMPTY when it’s time to restock at the farm. Eeasy to wipe down and no smelly what-the-heck-is-this?items for the compost anymore. Yeah, Jean-Francois can be a great fun to shop for when food is the object. In our early days in Japan, we’d rush to international foods shops in the big city, just to help us adjust better. I don’t think Jean-Francois and I will ever be able to equal your commitment to waste reduction, humanity, and food, but I hope we get to a reasonably respectful place nearby. From the list you provide of semi-use items, it looks like we are approaching our condiment collection with the same rationale: What ingredients are at the core of our favourite, most common meals and keep those stocked. We are getting to a list of key, core ingredients that I hope will further refine our collection of processed condiments. Happy that our shame has helped you feel better. I like the idea of swapping with foodies. That is a great idea, and one that would help encourage more experimentation. Do you do this a lot? How is organized? If you have time, would you mind sharing? Thanks.